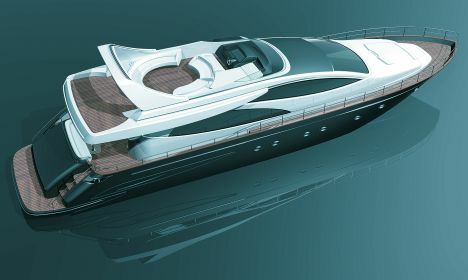 A new hull and new dimensions for "Opera", the yacht produced by the Italian boatyard Riva, belonging to the Ferretti Group. This new version of "Opera" has been created by the yard to follow in the footsteps of the success characterising the previous model. A larger bridge, stern garage big enough for storing a tender or a jet-ski, lots of windows, a complete makeover for the main deck to give more space inside, a roomier flying bridge characterised by an original design and more comfortable crew quarters; these are just some of the details of Opera's evolution, a model preparing for a new season of international successes. The company has signed an important agreement with the Benetti boatyard for all the supplies to the "Tradition" line boats of the following products: bilge pumps, pumps for fire fighting, deck and chain washing, transfer of diesel/various fuels and hand pumps, as well as boilers, autoclave and ventilation units, complete with all the accessories. Still on a theme of super-yachts, this time with sails, after specific studies in collaboration with Perini Navi technicians, Gianneschi & Ramacciotti have also supplied special pumps, autoclaves and boilers for "Maltese Falcon", the new 87-metre that this Viareggio-based boatyard is building in Turkey. For information: Gianneschi & Ramacciotti - via G. Pastore 19/21 55040 Capezzano Pianore - Camaiore (LU) - tel +39 0584 969391 - fax +39 0584 969411. In the last number of Super-yacht, January 2004, on page 124 we spoke of the Super-yacht Society Design Awards, incorrectly naming Francois Zuretti as interior design for "Only Now", the boat produced by the French boatyard CNB-France and awarded a prize by the Super-yacht Society. The design studio responsible for the prize-winning interiors was in fact Couedel Hugon Design. Dario Mazzara Marine Service has been operating on the Island of Ischia (NA) since 1995, offering numerous services, from management and administration of yachts to supervision of maintenance and new constructions, transfers, EC branding for pleasure crafts and inspection visits. Furthermore, the company represents a point of reference for those intending to spend their boating holidays on this Campania island, with services and solutions dedicated to pleasure sailing. For information: Dario Mazzara Marine Service; via San Francesco 10; 80075 Forio d'Ischia (NA); tel./fax 0039 081 998630. Work continues for members of the Propeller Club Port of Italy South. A round table is scheduled for the end of the month at the Naples Chamber of Commerce, with participation by leading figures in the world of shipping, sailing and the aeronautics and insurance sectors. The event Is entitled "Mare, spazio, Alta Tecnologia, Profili di integrazione" (The sea, space, High Technology, Integration profiles) and will include contributions by important exponents of each individual sector. During this encounter the most urgent problems will be discussed in order to promote development of the sailing, pleasure, shipping and aeronautical sectors in our country. The most urgent themes will include main sea routes, air routes and sailing tourism. Attention will also be given to the question of the lack of port infrastructures adequate for a development programme able to give impetus to the sectors involved. The session will be chaired by the general secretary of the club, the lawyer Giovanni Scognamiglio, assisted by council member Dr. Annalaura di Luggo. Traffic at a standstill in the heart of the city of Viareggio, in the famous via Coppino where both the Benetti boatyard and the Italia dockyard are located, for the launch of "Joe" (FB230), the most recent of the super-yachts produced by the titled "brand" of the Azimut Group, a boat designed by Stefano Natucci, with Francois Zuretti responsible for the interiors. A colossus in steel that was a moving sight as it slid quickly towards the water of the basin, accompanied by the sound of sirens and the applause of the many spectators. Fifty metres of boat for use by an English owner and his lady - for the occasion she was also the lady who launched the boat, breaking the classic bottle of champagne on the bows - where technology and luxury come together in a clear example of high quality, stylish "made in Italy". 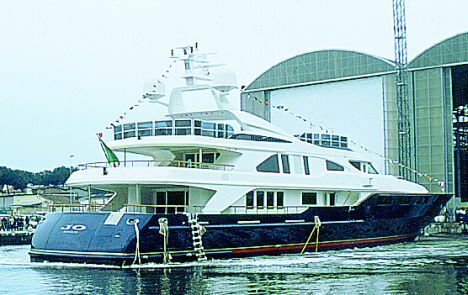 The ceremony was attended by local authorities, numerous invited guests and obviously also the president of the Avigliana Group, Dr. Paolo Vitelli, satisfied to see this motor yacht's entrance into the water, further projecting the image of the Benetti yard with its productive structures in Viareggio, Fano and Livorno, as world leader in the construction of motor super-yachts.